Proof of Spirits? You be the Judge! The experiments were conducted during the latter months of 1920 by Dr. Gustave Geley, a French physician who taught medicine at the University of Lyons before becoming the director of the Institut Metapsychique International in Paris, where he devoted full time to studying mediumship and other paranormal phenomena. The medium in this case was Franek Kluski, a 50-year-old Polish writer and poet who had discovered his mediumistic abilities just 18 months before Geley began studying him. Charles Richet, M.D., Ph.D., a professor of medicine at the University of Paris and the 1913 Nobel Prize winner in medicine, assisted Geley in some of the 14 experiments with Kluski as did Camille Flammarion, a world-renowned astronomer. All of the experiments were conducted in Geley’s laboratory behind locked doors under strictly controlled conditions. There was no opportunity for the medium to smuggle anything into the room and the medium was always searched before entering the room. With some mediums, so careful was Geley that he went so far as to require gynecological and rectal examinations to be certain nothing was smuggled into the room in an orifice of the body. Because the ectoplasm produced by mediums is sensitive to bright lights, red lights were used, permitting adequate visibility, although it was inadequate for photography and there was concern that flash photography would injure the medium as it had reportedly done with other mediums (since the ectoplasm has to be reabsorbed by the medium). Geley further noted that the lights represent the first stages of materialization. They would sometimes disappear at once and sometimes proceed to characteristic human forms. 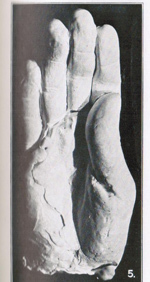 As Geley, Richet, and other researchers came to see it, the fact that many of the materialized forms were incomplete or fragmentary, sometimes very hokey looking, did not suggest fraud, as many skeptics assumed. Rather, they were simply indications that the medium was not strong enough or developed enough to produce complete materializations. In fact, the incomplete and stranger manifestations seemed to run contrary to any fraud explanation as it is highly unlikely that a charlatan would have expected anyone to believe they were real in the first place. Communication from with the “entities” was carried out by loud raps, e.g., one rap for no, three for yes, and so many for each letter of the alphabet, and there was no question in Geley’s mind that there was some kind of intelligence operating. At one sitting, the entities asked those in the room to sing, apparently because more harmony was needed, and as they sang, Geley and the others heard hand clapping, apparently from several entities. To completely rule out any sleight of hand by Kluski – although Geley and the others were certain he was not a trickster – Richet held one of Kluski’s hands while Geley held the other during the experiment. In their experiment of November 15, the hand of a child was produced in the paraffin. In a later experiment, on December 27, Geley and Richet added some bluish coloring matter to the paraffin. “This was done secretly, to be an absolute proof that the molds were made on the spot and not brought ready-made into the laboratory by Franek or any other person and passed off on us by legerdemain,” Geley further explained. Two very good hand molds were obtained, one a left and one a right hand, both the size of children five to seven years old.” He further noted that both had a blue tinge to them. And so what is to be made of the paraffin hands? Is it evidence of spirits? Does the evidence add up to proof for those with open minds? As Berger points out, if a person is willing to accept the credibility of Geley, Richet, and the others conducting the experiments, it is very difficult to conclude that fraud was involved. Then again, there is a school of thought, one which Richet subscribed to, which holds that the subconscious mind is capable of producing such phenomena, even though science is incapable of understanding it. Publicly, Richet, while recognizing the reality of various phenomena, rejected the spirit hypothesis, perhaps out of concern for his high standing in the scientific community, although there were indications that privately he accepted it. And that “high probability” seems to equate to the “beyond a reasonable doubt” standard which Berger holds to in his book. However, that is the standard in criminal law. The “preponderance of evidence” standard of civil law is much easier to meet than the “beyond a reasonable doubt” standard, so even if there is reasonable doubt one can still conclude that there is a preponderance of evidence in favor of spirits. In effect, that means that the spirit hypothesis is more likely than the fraud, subconscious, or any other far-fetched explanation. Still, the closed-minded “skeptic” insists that those esteemed men of science must have been duped somehow, because there is no spirit world and therefore fraud is the only explanation. The regurgitation theory was advanced by some “skeptics.” That is, the medium swallowed the material before going into the room and then regurgitated it after entering the room, the dim red light preventing the researchers from detecting it. However, Geley and other researchers were aware of this theory and took special precautions to rule it out. With another medium studied by Geley, a hard-core materialist, upon hearing of all the controls exercised by Geley, suggested that perhaps the medium had a false tooth in which she smuggled various things into the room. And so it goes, if there is a “will to disbelieve,” there is never enough “proof” for the “skeptic” and there apparently never will be. In a 1995 book titled Bizarre Beliefs, the authors emphatically stated that “there are no ghosts, no poltergeists, and no hauntings. They are all mistaken, imaginary or fakes.” Much of mainstream science shares this view, but Guy Lyon Playfair, a British journalist, author, and psychical researcher, knows better, as he has been involved in investigating a number of poltergeists, including the Enfield Poltergeist, one of the most intriguing cases in the annals of psychical research. He will agree with the “bizarre” part, but definitely not with the denial of such phenomena. “Some take the easy way out of the dilemma and simply put their heads back in the sand,” Playfair writes in his book, This House is Haunted, which is about the Enfield Poltergeist, first published in 1980 and recently updated and republished by White Crow Books. The Enfield case took place during 1977 and ’78 in the northern London suburb of Enfield. It involved a divorced mother, Peggy Harper, and her four children, Rose, 13, Janet, 11, Pete, 10, and Jimmy, 7. The phenomena included large pieces of furniture being overturned, objects flying through the air and floating through walls, dancing slippers, levitations, coins falling from the ceiling, strange voices that often responded to questions, people thrown from their beds and chairs, mysterious writing on the walls, electronic disturbances, a number of ghostly apparitions, stones seemingly falling from the sky, excreta appearing in the sink and on walls, inexplicable outbreaks of fire, and mysterious knocks and footsteps. As a member of the Society for Psychical Research (SPR), Playfair, a Cambridge graduate who spent many years as a freelance journalist for The Economist, Time, and the Associated Press, was, along with fellow SPR member Maurice Grosse, asked to investigate the anomalous activity at the Harper home. Beginning in September 1977, the two researchers devoted some 14 months to investigating the case, often spending nights at the Harpers’ home and observing first hand some of the bizarre phenomena, which gradually declined and ended in early 1979. I recently had the opportunity to put some questions to Playfair by e-mail. Here is our exchange, with apologies to Playfair for converting the King’s English to the more crude American English. Guy, your book gives a lot of detail relating to your observations in Enfield, but I am wondering if there is one thing among the many things you experienced and witnessed that stands out more than the others. As you point out in the book, the two leading theories concerning poltergeists are that they are spirits of the dead or dissociated fragments of the personality of someone living in the home, in this case Janet, the 11-year-old. You concluded that the truth is probably a combination of the two. Would you mind elaborating on that a little? I was most intrigued by the voice or voices. You describe them as being loud and guttural, nothing like Janet’s normal voice. Ventriloquism was considered and ruled out. Although different entities communicated, did they all sound the same? “Yes, they were intriguing. The speech therapist we brought in was totally freaked out. We established that Janet was using her false vocal folds (plica ventricularis), which you can’t normally use for long without doing damage to your vocal cords. That’s just one of the things we discovered that should be of scientific interest and it’s a pity the so-called expert wasn’t interested. She just wanted to get out of the house. She might have written an interesting journal paper, but no doubt was scared of losing her job if she had. So much of this sounds like the Fox sisters of early Spiritualism history – knocks and raps, a man who had died in the house communicating, and then the newspapers offering bribes for a confession from the girls. Why do you think the newspapers and so many of your research colleagues would prefer the fraud explanation? You mentioned that just last year there was a breakthrough in poltergeist research, at least to the extent that the rapping sounds made by poltergeists are not the same as normal raps. Would you explain a little more about that research? Hashizume and I decided to do some banging ourselves for comparison. I’d hoped that somebody could study the sounds and see if ours were in any way different from those made by the Thing. We never managed to do this, and we didn’t know that several other people had recorded poltergeist raps including the BBC. In 2009 a colleague from the Society for Psychical Research named Barrie Colvin decided to look into the matter, and I helped him compile a collection of about 12 tapes from different cases. He ran them through his oscilloscope and saw at once that the poltergeist raps were quite unlike normal ones. You can find the details in the Journal of the SPR for April 2010. That was the good news. The bad news is that we sent out a press release to about 35 papers, magazines, radio and TV programs hoping that they would be interested in our instrumentally recorded and easily repeated hard evidence for an unexplained effect. In 2010 there was a major breakthrough in poltergeist research when Dr Barrie Colvin published the results of his study of tape recordings from a dozen cases in five countries in which rapping sounds presumed to be of poltergeist origin were recorded on tape. 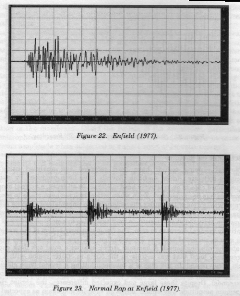 Comparing these with raps made by normal means, he found that the acoustic signatures were quite different, as can be seen in the above charts of raps recorded at Enfield. The bottom chart shows what three raps made by Playfair on the living room ceiling look like. The top chart shows the signature of a rap from the bedroom above, recorded on the same tape shortly afterwards. In all of the normal raps Colvin studied when he tapped wineglasses, struck piano keys, or made any other kind of percussive sound, the signature began at full amplitude and rapidly declined. All of the poltergeist raps he examined, without exception, did not, and reminded experts of signatures recorded during earthquakes. This discrepancy awaits explanation. Colvin’s findings were published in the April 2010 issue of the Journal of the Society for Psychical Research and are reproduced here with his permission. You wrote that it was becoming apparent to you at some point in your investigation that paranormal events only take place in the presence of people who believe them to be possible. Why do you think that is? I gather that you have investigated other poltergeist cases, especially in Brazil. Were they similar to the Enfield case? Do you really think that science will someday have a better answer for us as to what poltergeists really are? And what do you feel about the case now, more than 30 years later? This House is Haunted is published by White Crow Books and available in paperback and ebook formats from Amazon and all good online stores.